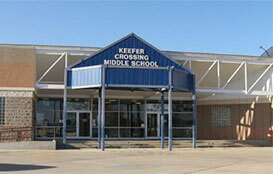 Keefer Crossing Middle School is dedicated to assist all students to reach their fullest potential intellectually, socially, and emotionally. Their goal is to guide each student to become a responsible member of society. They aim to help students be exemplary in every educational experience. They maintain a focus on hiring and retaining high quality and talented teachers and staff. All teachers have an online profile to which students and parents can subscribe to their updates. Part of the Texas TAP system, Keefer Crossing emphasizes teacher and student advancement. Numerous on campus clubs and programs including National Junior Honor Society, U.I.L., FCA, SPARK and Gifted and Talented.